Guest columnist Thomas C. Burns, Ph.D. Guest columnist Dr. G. Ross Roy. Who Are These Burns People? An article by Professor David Purdie, "What Burns means to me". An article by Dr. Carruthers, "What Burns means to me". An article by Billy Kay - "What Burns means to me". An article by Eddi Reader - "What Burns means to me". An article by Dr. Kenneth Simpson - "What Burns means to me". Alex Salmond Speaks at Burns Symposium in Washington, D.C.
An article by G. Ross Roy - "What Burns means to me". An article by Patrick Scott - "The Immortal Memory". Sunday Post articles on Robert Burns. The Bard - Robert Burns, a biography. The Bard. A Review of the book by Professor Gerard Carruthers. Chat with Robert Crawford author of "The Bard". What Burns Means to Me by James Macsween, Director, Macsweens of Edinburgh. What Haggis means to me. Book Review of "The Best Laid Schemes: Selected Poetry & Prose of Robert Burns" Edited by Robert Crawford & Christopher MacLachlan. Was Robert Burns a Member of the Friends of the People in Dumfries? Chairman of the Bard by Jim Gilchrist, The Scotsman. The 100th Anniversary of the Laying of the Cornerstone at Robert Burns Cottage By the Burns Club of Atlanta. Poetry Reading and Lecture by Dr. Robert Crawford. An Unpublished Letter from Burns to Prof James Gregory MD - with an early draft MS of 'On seeing a wounded Hare' By Prof. David Purdie MD FRCP FSA Scot. Editor, The Burns Encyclopaedia. A Million Reasons Robert Burns Will Never Die! 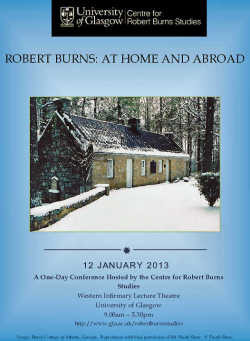 Burns and Beyond: A One Day Conference hosted by the Centre of Robert Burns Studies by Dr. Rhona Brown, University of Glasgow. Robert Burns – His Life, Illness and Death: 18th Century Medicine in Scotland By Thorne Winter, MD. This and That. Rachel Bergstrand and Natalia Kaloh Vid. Vindication of Highland Mary by Norman Paton. Book Review of "Robert Burns and Transatlantic Culture", Nineteenth-Century Transatlantic Studies, Edited by Sharon Alker, Leith Davis and Holly Faith Nelson. The Correspondence of Samuel Thomson (1766-1816). Fostering an Irish writers’ circle By Jennifer Orr, Editor. Robert Burns, Patrician Protégé, People’s Poet by Professor Christopher Whatley. Rehabilitating the Radical: Robert Burns in the Belfast Press in the Period of the Irish Act of Union by Dr. Carol Baraniuk. Robert Burns’s First Printer: John Wilson of Kilmarnock. Part 1: The Book Market in Burns’s Ayrshire by Patrick Scott. Robert Burns’s First Printer: John Wilson of Kilmarnock. Part 2: Printing Books for Local Authors by Patrick Scott. Atlanta’s Robert Burns Cottage by Frank R. Shaw. Whatever Happened to Gavin Turnbull? Hunting Down a Friend of Burns in South Carolina by Patrick Scott. What others are saying about Robert Burns Lives! Seceders and Satire: Ulster Poetry of the Romantic Period by Dr. Jennifer Orr. Eileen Bremner’s "The English Poetry of Robert Burns (1759 – 1796)"
Robert Burns 255th Anniversary from Robert Burns Kiev Junior Club. Thomas Campbell of Pencloe, New Cumnock, Ayrshire (1746 - 1831) By Chris Rollie, St John’s Town of Dalry, Galloway. A free online course on Burns from the Centre for Robert Burns Studies at Glasgow University January 2016. Nine Men: The Soldier, The Gardener (And not to forget the Innkeeper) by Dr Clark McGinn. Thomas F. McNally, Dean of Libraries, University of South Carolina on the Jean Redpath music collection. BURNS UNBROKE is a new adventure in the world of Robert Burns, and Robert Burns Lives! is proud to bring it to our readers. It is interesting, thrilling and full of thought-provoking Burns information that can easily become a favorite of many Burns readers, this editor included. The information below is very informative and those who have read our pages over the years should be happy to see what this new endeavor puts forth in the name of Burns. BURNS UNBROKE has agreed to share their programs and articles with our readers over the coming months. I already have another issue to publish and will be working in this area for the next few weeks. I am excited about this new venture and I believe you will be too.